Allergy Advice: Contains Wheat, Sesame, Egg. 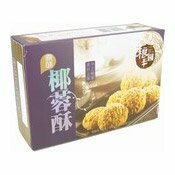 Ingredients: Wheat Flour, Sugar, Margarine, Coconut Shred (25%), Margarine, Pastry Margarine, White Sesame Seed, Egg, Leavening Agents (E500, E450, E170, E341). Simply enter your details below and we will send you an e-mail when “Coconut Cakes (糧豐園椰蓉酥)” is back in stock!